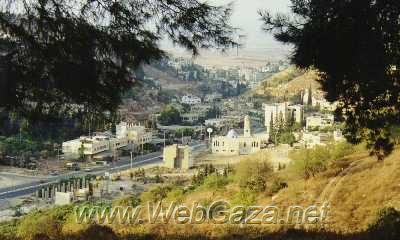 Jinin (Jenin) - Where is Jinin City Located? Jenin lies in the northern part of the West Bank, in the central part of Palestine. It was freed after 27 years of Israeli occupation on November 13, 1995, becoming the first liberated city of the Palestine National Authority after the Oslo 2 Agreement. Jenin has an attractive history, fascinating nature and numerous touristic sites. It is a regional center due to its proximity to the Israeli, Jordanian, Lebanese and Syrian borders. It is also a well-known stop-over for pilgrims to Nazareth and Jerusalem. The area of the Jenin Governorate measures 1,059,752 dunums, with a population of 233,000 people that are living in 13 municipalities, 68 local councils and 3 project committees. Jenin is one of the most ancient cities in Palestine. It's history goes back to 2450 BC, when it was built by the Canaanites, which makes Jenin almost as old as Jericho (8000 BC), Jerusalem, Nablus and Damascus. Jenin became part of the Islamic state in 638 AD. It was twice occupied by the crusaders, first in 1103 AD and after the liberation by Salah Addin Al Ayyoubi ('Salladin') in 1187 AD (in the famous battle of Hitteen) once more in 1229. It was liberated again in 1244 AD by king Al Salih Najm Addin Ayyoub. After 1244, Jenin flourished economically because of its location on the trade route Egypt-Ajlun (Jordan)-Damascus, until a major earthquake completely destroyed the city. Jenin city , like other Islamic cities, came under the control of the Islamic Turkish state (being the successor of the Abbasi reign) in 1516 which lasted till 1918 (the end of the Turkish Islamic Caliph state). The Biritish troops occupied Palestine in 1918. The British mandate started in 1922 and ended in 1948. During this period, Jenin along with other Palestine cities resisted the British troops bravely. The Municipality was first established in 1886 during the Turkish Islamic Rule. Since then 23 mayors succesively took charge of the municipality. The city area is around 7500 dunums (1 dunum = 1000 square meters) acoording to the urban organizational project of 1993, whereas the municipality is planning it to reach 11000 dunums. Sewage and Waste Water Dept. It is worth noting that since the Israeli occupation of the West Bank and Gaza Strip ended in 1995 (1967-1995) no activities of city development of nature took place in Jenin as such activities were always blocked by the Israeli restrictions. This also applies on the other cities and villages of Palestine. Paving 35 kilometers of new roads. Digging a new well of 210 cubic meters/hour in capacity. Maintaining some internal roads with the cost of 1.5 million US$. Installing thousands of meters of sewage lines which were not existing before. Rehabilitation of the public library and adding new books to it. Rehabilitation of the old electricity network. Establishing the city conference hall. Establishing an educational computer center in coorporation with the German Hans Seidel Foundation. Contributing in establishing and equipping the children devision in Jenin Hospital. Building a new reservoir with the capacity of 2000 cubic meters. Executing many other developmental projects. Also, there are other projects which will be executed in the near future such as rehabilitation of the water network and the construction of a municipal slaughter house. Establishing good local and international relations. Al Lajjoun located 1 1 miles NW of Jenin. Population: 1,103. Obliterated in 1948, with the Jewish settlement of Megiddo built on its 2,125 acres. Al Mazar/Jenin located 25 miles SE of Haifa. Population: 270. Obliterated in 1948; all its 3,625 acres were stolen. Nores located 12.4 miles NE of Jenin. Population: 570. Obliterated in 1948; all its 1,564 acres were stolen. Ziri’in located 8 miles north of Jenin. Population: 1,420. Obliterated in 1948, with the Jewish settlement of Yizre’el built in 1949 on its 5,550 acres of stolen land.